Mr Ranjan Ray is the owner of this Mahindra e2o electric car, which has now done over 1 lakh kms on Indian roads. He is one happy owner. Across the world, more and more car buyers are switching to electric, or other environment-friendly fuels in a bid to control global warming and climate change, along with reducing the strain on fossil fuels. Electric vehicles (EV) have been introduced in India quite a while ago, but their acceptance has been quite low in comparison to petrol and diesel vehicles. That has not stopped some car enthusiasts from adapting to electric vehicles, and contributing to underlying environmental causes. 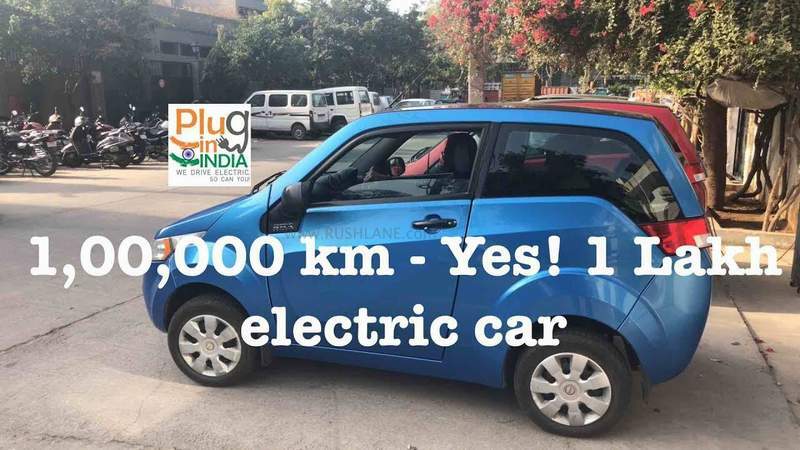 One such enthusiast is Mr Ranjan Ray, who has created a record of sorts by becoming India’s first person to drive 1,00,000 kms (1 lakh) in his Mahindra e2o EV. In his video interview by YouTube channel PlugInIndia, Ray describes his experience of using e2o, which has been both exciting and challenging. Ray purchased the EV around 4 years ago after he saw an advertisement in the newspaper. He was sceptical like most others but he decided to take the plunge. Now, after completing 1,00,000 km on his electric car, Ray says that it’s a proud moment for him. He feels a sense of achievement, since he had very few supporters in this journey. Data also supports his feelings, as the instrument panel indicates that he has saved 8,333 litres of fuel and earned 1050 eco points. He has spent around Rs 70,000 on electricity during the last four years of using the Mahindra e2o EV. Interestingly, the odometer has stopped at 99,999 since it seems not to have been designed to support more than 5 digits. Ray jokes that may be because the company folks may not have anticipated that a e2o would have been driven such a distance. The odd has been reset at 0. The battery still works perfectly fine, and he gets around 95-100 km per charge. The 1 lakh km mark was reached in April 2018. Speaking about the problems he faced in the last four years, Ray says that the car has developed various issues over the years and collectively it has spent around 6-7 months at the service centre. Many of the problems have been resolved, but some problems remain due to limitations of the existing design and technology configuration. Ray is hopeful that next-gen EVs in India will be more efficient, offer higher range, and remain problem-free even in harsh weather conditions. Ray suggests that auto companies need to take inputs and feedback from EV users, so that practical problems can be identified and resolved. He says that such a system does not exist currently. Ray also wants the infrastructure to be improved, so EV users can easily locate charging stations nearest to their location. About his future plans, Ray says that he does not want to upgrade since he wants to know how many more miles he can extract from his e2o. It has become an interesting challenge for him, and may be completing 2 lakh kms could be his next major milestone. We wish him the best of luck, and thank him and other users like him who are making a difference by switching over to electric.